21.5" LCD has stylish design for a sleek, black floor display. 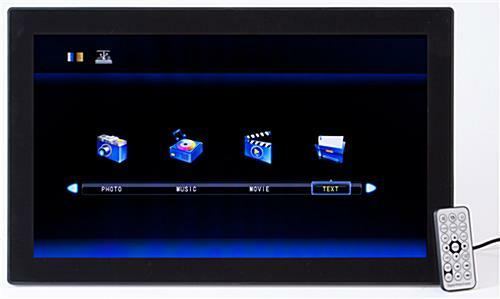 Automatic "plug and play" electronic player to immediately play images, videos, and audio for effective advertising. 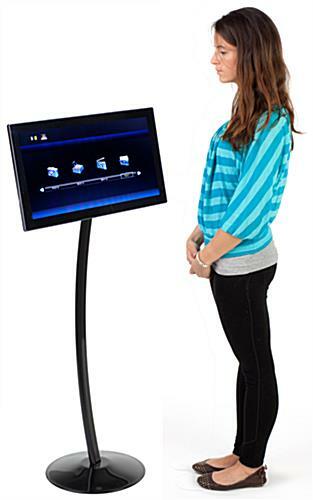 Floor unit has a 90° tilt to view digital signage at the ideal angle. 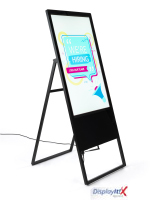 This digital photo frame stand all-in-one advertising kit includes a digital signage device, a floor unit, and a bracket for in-store displays. These picture and video tools can be used in a wide variety of environments including retail and commercial use. The digital photo frame stand, called a point of sale accessory, immediately catches the eye of customers passing by a location with dynamic imagery and video clips and random slideshow transitions. Users can now display instant images inside a store for customers to see. A digital photo frame stand, for floor display use, has an advanced technology LCD screen to deliver quality photos to patrons. 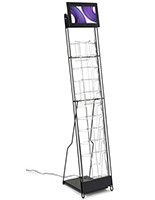 This floorstand has a 90° adjustable tilt to set the device at the ideal viewing angle for display. The digital photo frame stand, that is displayed at eye-level, can be viewed at a horizontal and vertical orientation. 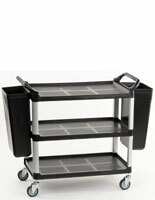 The LCD unit can be used as a marketing tool in all types of establishments. 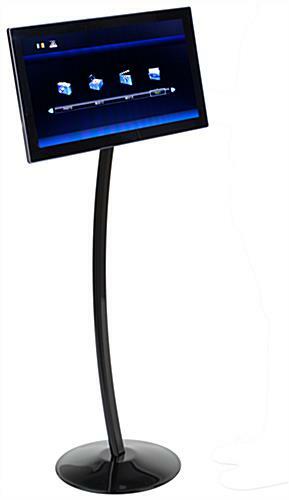 A POS tool, digital photo frame stand, is an effective way to engage customers in a store. Whether this floorstand is purchased for a retail or commercial environment, it is guaranteed to enhance a business atmosphere. A digital photo frame stand, for the floor, has a sleek look with the curved unit and black finish. 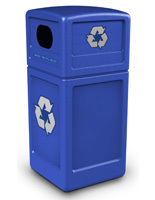 The fixture can display any type of advertisement, picture and video to grab patron's attention. This digital photo frame stand, that is easy to adjust, should be placed in a high traffic area. 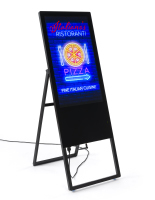 The LCD signage is commonly seen at tradeshows, museums, hotels, and retail locations. A digital photo frame stand, that includes a 90° tilt, is an ideal choice for attractive and effective in-store displays! In matter of minutes, instant images can be featured inside an establishment! Supported Video Files: MPEG2, MPEG4, H.264, RMVB, AVI, (.avi/.mov/.ts/.mpg/.m2ts/.mkv) etc.1080P max. 21.3" x 13.0" x 1.0"